Just taking tests is not enough! You need to analyse your performance to find your strong and weak areas. Remember, UPSC Civil Services Exam is a competitive exam, and it is extremely important to know where you stand. Go through the detailed performance reports to find areas where there is scope for improvement! ClearIAS has provided the facility of revision of answer keys and detailed solutions of each completed mock exam. This is in addition to the facility of generation of answer keys and detailed explanations, soon after the completion of each mock exam. This can be easily accessed from this page (as well as from “My Account Link in the Menu). Just go to (‘Completed Exams’ ⇒ Details ⇒ View). You will get detailed solutions for each completed exam. Refer the above screenshot for directions. For extra marks – Take Maximum ClearIAS Online Mocks! These links will get automatically updated each time you take a mock test. 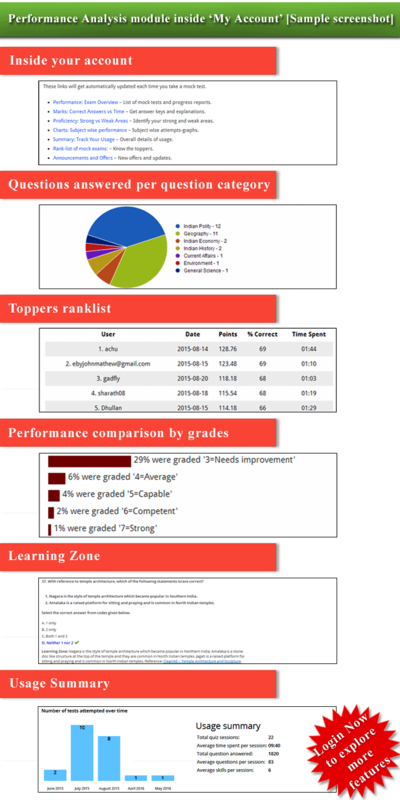 Performance: Exam Overview – List of mock tests and progress reports. Marks: Correct Answers vs Time – Get answer keys and explanations. Proficiency: Strong vs Weak Areas – Identify your strong and weak areas. Charts: Subject wise performance – Subject wise attempts-graphs. Summary: Track Your Usage – Overall details of usage. Rank-list of mock exams – Know the toppers. Announcements and Offers – New offers and updates. Pay now and get access to all existing and future mock tests at discounted price!